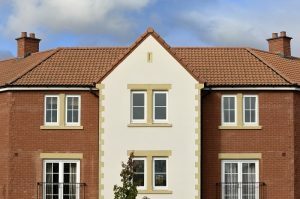 In the second and concluding part of our series, David Patrick, Head of Marketing at Redland, continues his tour of the UK and looks at the roof tile styles to be found in the east, west, Wales and Scotland. 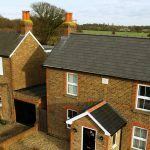 Having looked at the plain tiles of the south east and London’s 49s of the south east, we now venture into the west and Wales, Scotland and the east to consider some of the tiles most commonly found in those regions. 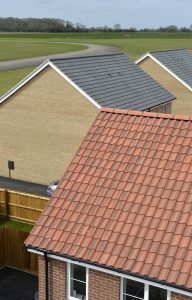 In the west of the country, especially around Gloucestershire and Avon, it is common to see ‘Double Roman’ tiles on roofs, whether it’s a new home or a heritage building. These Double Romans hark back, as the name suggests, to the Roman invasions of Britain in 43AD. The tiles are based on their imbrex and tegula tiles. The tegula was a flat tile, while the imbrex was a half-cylinder, overlapping the joints of the tegulae. It is said that the half-pipe shape of the clay imbrex was achieved by moulding a flat sheet over the thigh of a slave! The imbrex and tegula tiles replaced wooden shingles, and were found on all types of buildings – from humble cottages to grand temples. Modern Double Roman tiles come as interlocking concrete tiles, and mimic the effect of the original Roman profile while being compatible with a wide range of fittings and accessories. Pantiles are S-shaped tiles, normally made from concrete or clay and are single lap, meaning that the end of the tile laps only the course immediately below (plain tiles normally lap two courses). A pantile-covered roof is considerably lighter than a plain-tiled equivalent and can be laid to a lower pitch. Pantiles are most common in eastern coastal areas – especially the Fenlands of Lincolnshire, Cambridgeshire, Norfolk and Suffolk. The reason for this is the trading links with the low countries, especially Holland in medieval times. Business was brisk, particularly in the wool business, with many Flemish weavers settling in East Anglia. Merchants would unload their wool cargoes, before retuning with loads of pantiles to act as ballast in the bottom of their ships. Contemporary Fenland Pantiles come in an interlocking concrete format that ensures robust, weathertight performance and are found in a range of subtle ‘through coloured’ and pigmented acrylic finishes. As with clay, and timber, it was obvious in ancient times to look to nature for building materials – and there are few more obvious than slate. Centred around Caernarfonshire, north Wales, slate has been quarried in the region for over 1800 years. In 1882 the county’s quarries produced over 280,000 tons of finished roofing slates, and in 1898 the slate trade in Wales as a whole reached its peak with 17,000 men producing 485,000 tons of slate. Although a conspicuous feature of the Welsh architectural scene, it was the Industrial Revolution that transformed the slate industry and the pathway of slate as it spread into the north west and Scotland is a mirror of the development of roads, railways and canals through the 19th century. Unfortunately, for cost reasons, the majority of roofing slate nowadays is imported. But the beauty of Welsh slate is still available in reconstituted tiles. Made from recycled Welsh slate, these capture all the beauty and character of natural slate and provide outstanding aesthetics, performance and installed-cost benefits.